The city is starting to think about fixing some of our local roads. We frequently hear that the west side of El Paso “gets more” than other parts of town. There are two other slides in the presentation. They list streets in districts other than the west side district (number 1). The city is thinking about doing work on three streets on the west side of town. The three streets are all in the Kern Place/Cincinnati area of town. The rest of the neighborhood streets in the west side will get nothing. This entry was posted on Tuesday, January 23rd, 2018 at 5:59 AM and is filed under City government. You can follow any responses to this entry through the RSS 2.0 feed. You can leave a response, or trackback from your own site. The contract that was approved today included two parts: 1) the remaining streets from the original 2012 Street CIP for resurfacing that were moved forward by Council action to complete sooner than previously programmed, and 2) major arterial street resurfacing candidates that were approved by Council action in October 2017. 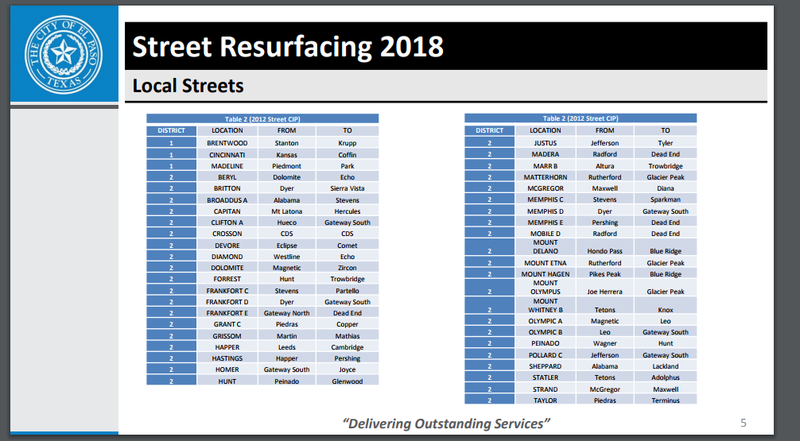 Most of the streets on this list were already programmed in the resurfacing contract that was awarded last Sept 6, 2017. Which is the list on the link below. The link lists the streets that will be paved in District 1 as part of the 2012 Streets CIP. It look like there will be major face-lift on Doniphan. That’s a state highway — no city money will be spent. And, the rest of the sorry streets, in other districts? From the looks of that slide, district 2 has long been ignored. Good to see all that paving coming up in my district…as long as they don’t issue certificates of obligation to pay for it.